Space, The Final Frontier. Where no man has gone before. These are not just the introductions to the long-running Star Trek franchise, they are also a universal truth. Even now, when man has walked on the moon and satellites have orbited planets as far as Jupiter and Saturn, man has not truly been in the heart of space. Without the constraints of the Cold War and with the advancements made in modern technology, space has become a limitless frontier where daring trailblazers are making new headway every day. On July 29, 1958, NASA was founded by then-president Dwight D. Eisenhower. By October first of that year, NASA officially began operations. By 1962, the first man, John H. Glenn, Jr., orbited the Earth. There was the Soviet Union’s Sputnik and NASA’s Apollo projects, and all of this before the end of the 1980s. By the turn of the century, it appeared almost as if humans had gone as far as they could push into space with their technological advancements, and then came the new wave of space race. Since then, space has become less about discovery and more about making a claim. Movie and music franchises, toys, and photographs have all been sent off into space. From Luke Skywalker’s lightsaber to a 3D printer, space has seen it all. In fact, at one point, space even had pizza delivery. In 2000, Pizza Hut sent a pizza to Russian cosmonaut Yuri Usachov. 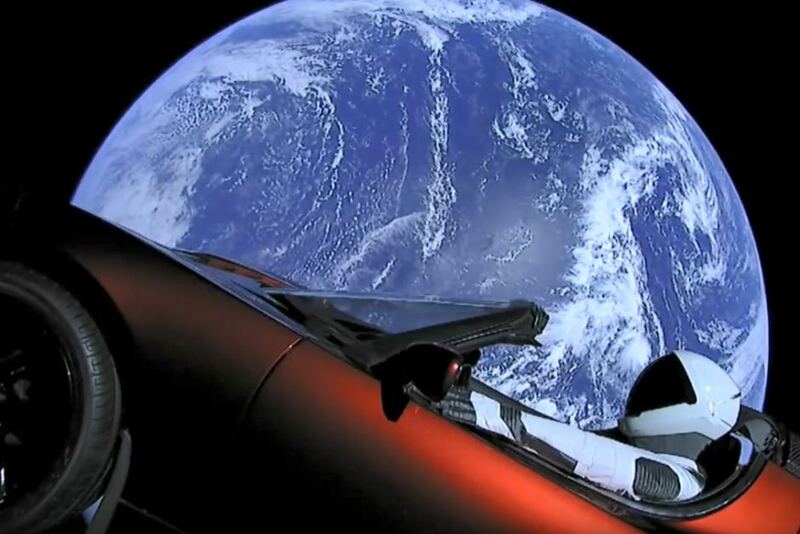 Yet, space had never seen a car before now. The revival of astronomical interest came from SpaceX, a private aerospace company fronted by Elon Musk. Within the 15 years that the company has existed, SpaceX has already successfully entered into space flight. Launching an electric Tesla on their rocket Falcon Heavy towards Mars back in February, Musk hoped to make a statement about the state of humanity with his choice, in expensive taste, being brand-name vehicles. More specifically, the previously mentioned Tesla. “Life cannot just be about solving one sad problem after another. There needs to be things that inspire you, that make you glad to wake up in the morning and be part of humanity. That is why we did it. We did it for you,” he tweeted about his reason for launching the car. There was, however, speculation that he did it for his own ego, as Musk owned both the car and the company which produces it. Regardless of his motives for sending the car to space, it remains clear that Musk has no intentions of stopping with just the car. His next goal is to send a 157-foot spaceship into Mars known as the Big Falcon Rocket, which he anticipates being able to run test flights by the summer of 2019. While the original Space Race was a race between NASA and the Soviets, this race is between big government funded companies and small companies. Nowadays, corporations such as those funded by American and Russian government investors often work together for better success, leaving companies such as SpaceX to fend for themselves. Although this makes launches and funding more challenging, it is still appealing to many, including Musk. Space, that vacuum of nothing that captivates the human mind. It’s the only mildly gravity-filled span of universe which we naturally gravitate towards regardless of the laws of physics. The glory days of orbit after orbit and lunar landings may have ended by the start of the ‘90s, but that love of seeing the stars is still strong. This love has urged Pizza Hut and Star Wars to mark their existence in the lasting vacuum, and has also led to SpaceX’s red tesla riding the rocket to Mars.